The other day I was reading an on-line article which described a condition affecting many people this time of the year. Experts call it “The Post-Christmas let-down”. It is defined as the felling we get when after all the preparations, all the efforts, all the anticipation for “Christmas Day”, we find ourselves asking “That was it?? Is this what Christmas is all about?” The cause for this problem is the way our culture raises the expectations for Christmas day. For weeks we are encouraged to expect the perfect present under the Christmas tree, we are encouraged to dream of a “White Christmas”, and we are promised that in this day will be as much fun as “Dashing through the snow in a one horse open sleigh” “laughing all the way”. For many people however, the reality of this day is very different. Most likely we did not get what we were hoping, or didn’t do all the things we wanted to do, and some us even, spent our Christmas wishing we could be with someone else or in some other place. In a culture which encourages and celebrates “Instant Gratification” we run the danger of putting all of our effort on making every second of Christmas day perfect, forgetting what we are really celebrating. So when the day is over we are left with toys to put away, presents to be return, kitchens full of dishes, living room full of wrapping paper and empty boxes, and Christmas ornaments which need to be stored back to be used next year… Do this sound familiar?? The reality is that for us Catholics December 25 is just the beginning of the Christmas season, a season which last 12 whole days and ends today with the feast of the Epiphany. A feast that, it seems to me provides an antidote to this dreaded Post Christmas Let Down. So my brothers and sisters, if you have been suffering from this Post Christmas Let Down, let me give you three simple steps to salvage what is left of the Christmas season: Number One: take some time to reflect on what we were truly celebrating: Images of the sweet baby in the manger are nice, but also remember that by taking human form, by appropriating for himself the flesh of the Blessed Virgin, and molding a human body from her, the creator of the universe has taken the whole of the human race and lift it up to a dignity greater than anything else in creation including the angels! Because of the incarnation we have been given the opportunity to one day be as close to God as Mary was when God Himself was in her womb, feeding of her and sharing of her own life! That is the mystery of the incarnation. Number two: spend some time looking at what you have received; look at each present as a token of love from God himself. What is God telling me through each present I have received? It does not matter if we are talking about a toaster or a video game; how does God want me to be happy with what I have received? What part of my life has been blessed by each gift received? Number Three, and this is the most important step, think about how am I going to use this present to give back to God in thanks? How can I give of myself to the person who gave me each gift? 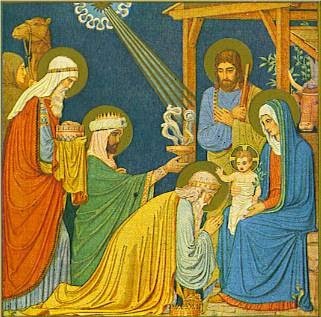 The beauty of the Christian celebration of Christmas is that we have twelve days to do this, and on the last day, today, the feast of the Epiphany we are given the Three Wise Men to show us how they were the very first people who celebrated Christmas with these three steps. Let me show you; First they used science of their times and listened to the ancient prophesies, to realize that an amazing event was about to occur: the creator of the universe, loving His creation to the extreme, decided to enter into our history and become one of us. Second, they looked at their own resources, the gifts they had received from God as wise kings and scientists of their time, and understood that they were given these as a blessing; so that they could witness, be part of such a momentous event. So without delay they undertook the long trip to a far away land, a trip that would put them face to face with the living God, Emanuel, God in the flesh. Third, when they finally arrived to the house were the babe and His mother were, returned to him what they themselves had received, Gold, Frankincense and Myrrh, symbols of kinship, divinity and a life given for others out of love. The Gospel reading tells us that the Three Wise Men were overjoyed when the saw the star stop at the house were Jesus and Mary were, the end of their long ordeal. Overjoyed, that is the felling we get when we celebrate Christmas the right way. The reason why we suffer of the dreaded Post Christmas Let Down is because in our mind Christmas ends on December 26. But for those who live their lives with the realization of the incredible gift God the Father has given us in Jesus, the realization that everything we have is a reflection of this blessing, which awakes on us a desire to return this blessing to Him by blessing others…for those who follow the example of the Three Wise Men, Christmas never ends, Christmas is a way of life. The one sure antidote against the Post Christmas Let Down is living our lives as if Christmas happens every day of the year.